Morning view from the canopy walk. The majority of the ride saw us distracted by the extraordinary beauty of the rainforest that flanked us on both sides of the river. 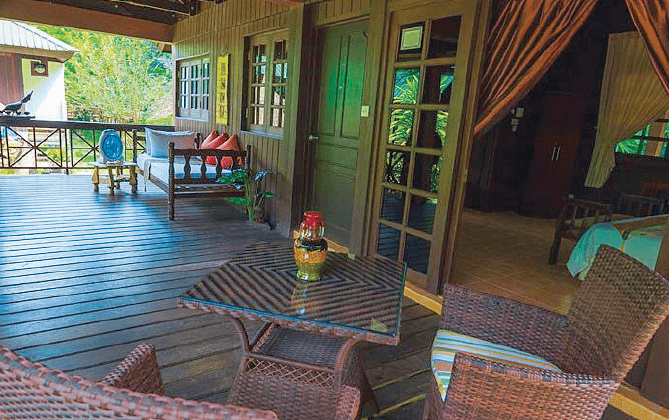 The entrance to the Pergola Suite, a twin-share superior room with a forest view. As the current in the Belalong River was not strong, we floated at a lazy pace, which allowed us to soak up the experience. This article first appeared in The Edge Financial Daily, on September 6, 2016. The best thing about being in the company of lifelong friends is that you can really let your guard down and be yourself. Sometimes you may even feel like a kid again. Age catches up with the best of us and as we see ourselves past a half century, we realise what a treasure these outings together really are. 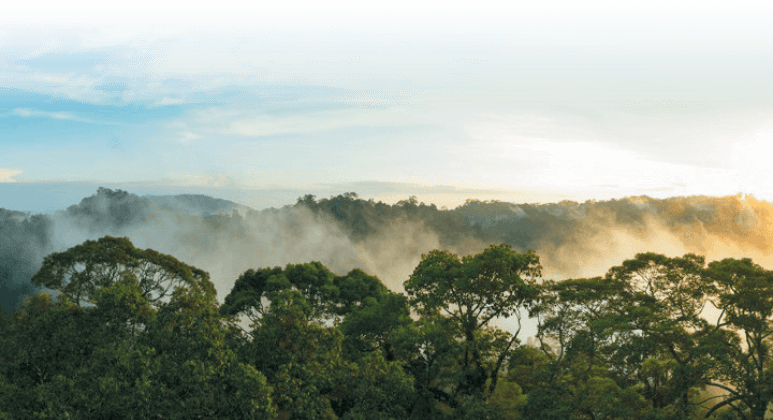 Our recent trip to the Ulu Ulu Resort in the Ulu Temburong National Park of Brunei Darussalam was exactly that — a treasured memory that will be firmly etched in our minds for many years to come. My friend Anthony Chieng manages the Ulu Ulu Resort and invited some of us to come over and experience the national park. So we quickly massaged our schedules, freed up some time and crossed the South China Sea by air. We stayed one night in Bandar Seri Begawan and headed off bright and early the following morning to catch a speedboat to Bangar. The speedboat carved swiftly through the meandering waterways, while the air flowing through the open windows provided a welcome relief from the tropical heat. The journey itself did not last long and after about 45 minutes, we were lugging our bags towards the van that would take us on a 25-minute overland trip to the Batang Duri Jetty. From here, we would travel by “Temuai”. “Temuai” is a river longboat. While the Temuai experience itself was short, it was certainly exhilarating. The water level was said to be on the low side, which added about 10 minutes to the trip that would normally take half an hour. Believe me, we would not have minded if it took twice the time. On the journey upriver, we travelled against the current and ran into many shallow patches where the rocky riverbed was clearly visible. Even with the Temuai’s flattened hull, the boatmen were clearly experts at avoiding the rocky outcrops that could have put a dampener on our national-park experience. While our focus on a small part of the Temuai ride was on keeping our rear ends firmly on the boat, the majority of the ride saw us distracted by the extraordinary beauty of the rainforest that flanked us on both sides of the river. The towering dense canopy of green hues mixed lightly with specks of colour broken by shards of sunlight beaming through. The riverbanks and river itself filled with the remains of fallen giants that bear testimony to the forest renewing itself. No words or photos could do it justice. It was a humbling experience to be in an unspoiled part of this world, especially for us city boys. As our boat approached the resort, we were surprised at its size and elaborate structures. It must have been difficult to cart in all the building materials needed for such a complex construction in the middle of the jungle only accessible by the very same boats that we were on. Later, we would be told that everything seen in the resort was brought up by the amazingly versatile small long river vessels. As we looked down from the walkway, the river was so inviting. After voraciously guzzling down our lunch and settling our accommodation, we succumbed to the river’s call. The water was a clear green and cool to touch. Walking in proved a little challenging as we struggled to find our balance on the rocky riverbed. We soon found our “river legs” and settled in the water for the long haul. Even as our fingers began to resemble old prunes, none of us made the first move to get out. Eventually, reason prevailed and we reluctantly left the cool clear waters, resolved that we would return and immerse ourselves again the very next day. All our meals were prepared by the kitchen staff and made up of various local delicacies. The ingredients were sourced locally, with some vegetables and herbs taken from the resort’s own garden. The advertised healthy cooking policy using less oil, no monosodium glutamate or flavouring, no recycled oil and no processed sugar — which we all thought would equal tasteless, bland food — actually yielded some pretty tasty concoctions. No complaints. It was simple and tasty food. And it gave us the energy we needed for Day 2. We crawled out of bed on Day 2 at 6am and readied ourselves for the hike up the jungle trek to the canopy walk. We filled our complimentary water bottles, sprayed on insect repellent and walked to the very edge of the resort. Unfortunately, the suspension bridge was closed for repairs, so we had to cross the river by boat. Once on the other side, we entered the jungle and began our trek to the top of the hill. More than 90% of the trek was made much easier with the presence of stairs and handrailings, and the only challenge was the seemingly endless climb up and up. Eventually, after numerous rest stops, we reached the top with our water bottles nearly empty and shirts drenched in sweat. The canopy walkway is supported by galvanised steel scaffolding towers firmly planted in concrete slabs. You are supposed to ascend on the first tower via a series of steps and then traverse the walkway to the other towers, where you are able to climb higher to view the grand green forest canopy below. At the last tower, you descend back to Earth. It is not for those that have an aversion to heights. I myself chose to keep my feet planted firmly on the ground and watch as my friends climbed higher and higher. As I did not experience the canopy walk myself, I can only offer their view of it being akin to walking on the top of the world. A wonderful experience, or so they told me. The walk down was less of a challenge as it was mostly downhill. After breakfast, we returned to the river as promised and soaked ourselves thoroughly. Both the low water level and diminished current allowed us to park ourselves in the middle of the river and greet all the longboats carrying day-trip visitors heading for the canopy walk. We were so into the experience of being in the water that we did not notice how the sun was nicely burning us until much later. After lunch, plus a short rest, we made our way to the edge of the resort once again, and this time we would get into kayaks and paddle up the Belalong River, a tributary of the larger Temburong River. It was halfway up that we decided to put our kayaks into the accompanying longboat and replace them with tyre tubes. Helmets on, we placed ourselves in the tyre tubes and allowed the water’s current to catch and float us back downriver. 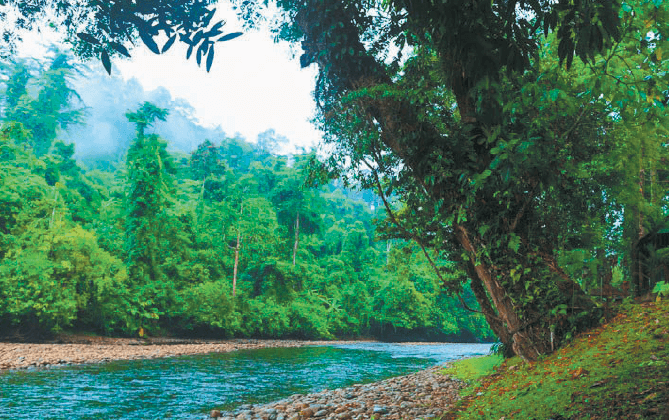 As the current in the Belalong River was not strong, we floated towards the Temburong River at a lazy pace, allowing us to soak up the experience. We looked up at the green giants that cast their shadows on the river in silent awe. These centuries-old magnificent trees are one of the true manifestations of nature’s beauty. Without longboat engines to create interference, the silence was broken only by the distant sound of fast-moving water, the occasional birdsong and, of course, the quartet of insect calls that we knew would form a full orchestra come nightfall. As we turned into the Temburong River, the current picked up and took us faster towards light rapids. Manoeuvring on a tyre tube isn’t all that difficult. There aren’t any paddles of course, but you can roughly steer a course using your arms. As we picked up speed, we used everything we had to avoid the shallows where rocks poked through the surface of the water. As we floated down the rapid water, we straightened our bodies to avoid our backsides from being grazed by the rocks. Even then, some of us got firmly stuck and had to be helped loose so that we could continue on our way. As we floated down the Temburong River and passed the resort on our right, it began to rain. The rain was not unwelcome and it fitted in snugly with the experience. It was after all a rainforest. It quickly turned torrential, but did nothing to dampen our resolve to carry on. We continued floating downriver and eventually made calmer water where the longboat was waiting. The boatman signalled us to make for shore. As I extricated myself from the tyre tube that had become a close and personal friend on my journey downriver, I remember feeling a little sad, but allowed it quickly to turn into hope that I would do it again. Some day soon. Having surrendered our tubes and with the rain still carrying on its onslaught, we started to trek inland through a stream that had cut a path into the jungle. It was not a large stream and we easily travelled through its shallow flowing water that fed into the main river. We reached the mini waterfall after a 10-minute trek, and I remember thinking that it didn’t look very “mini”. The rain had fed and swelled the water. 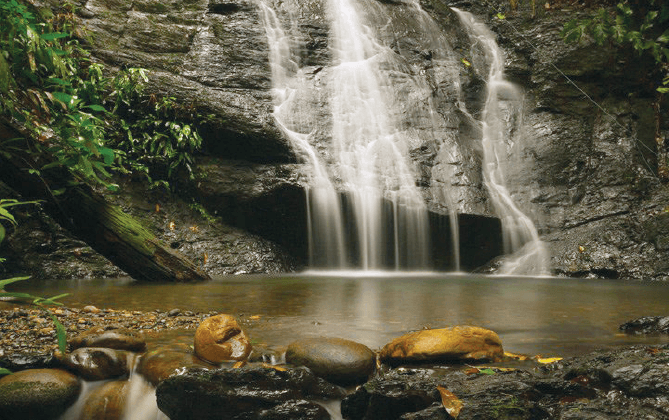 Unperturbed by the increasing water volume, we ventured into the waterfall’s pool to try the natural fish spa. As soon as we entered the water, little fish started nibbling at the dead skin on our feet. The further in, the more intense the nibbling. While this was definitely not for the ticklish, we endured the sensation for a little while until our guide said it was time for us to leave as the water was rising. On the way back, the stream had graduated into a small river, making it a little more difficult to trek through. We emerged from the jungle and made our way to the waiting longboat utterly soaked and drained from a full day of adventure. We looked forward to our barbeque dinner, but the knowledge that we would leave the following morning was a little bit of a downer.